What has changed during the last month? The days became longer, the sun - warmer and the e-Commerce blogs gained in weight. If you were too busy enjoying the fragrant flower aroma, no worries - Cart2Cart won’t let you miss a thing! 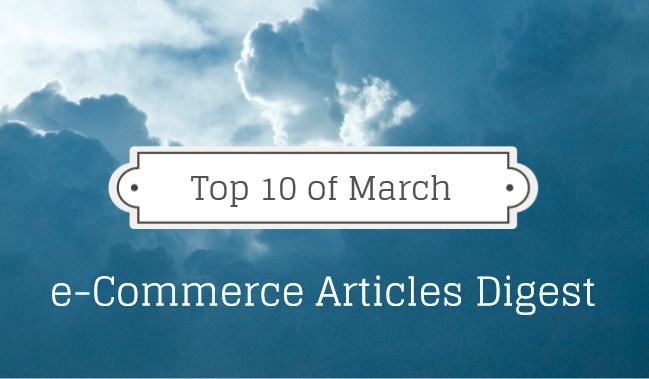 Therefore, we have prepared yet another monthly digest - Top 10 e-Commerce Articles of March. 1. Let’s start with the basics - SEO. How many times have you heard this abbreviation? And how good do you actually deal with it? If you’ve ever experienced difficulties with search engine optimization strategy building, there is no better article to read than “11 SEO questions you need to answer before starting an online store”. Enrich your knowledge with PrestaShop guru! 2. Are you keeping finger on the pulse of e-Commerce market? Though positioning yourself as an original merchant is not a bad idea, you should never neglect the importance of global trends. Thanks to iVentures Consulting, you have an opportunity to get acquainted with “6 Global, Online Shopping Trends that Could Impact Your Business”. Remember, if something gets popular - it works. 3. Even the “trendiest” e-store owner has no right to blame a customer for being cautious about spending his money. However, staying suspicious to the merchants, shoppers are much more trustful of others alike. That is why customer product reviews obtain a magic power of persuasion. Just let them speak out and “Increase Conversions With Customer Feedback”. 4. No matter how good the feedback is, your customers won’t buy a product unless they really need it. But how to know what client’s variable nature is willing to get today? Thankfully, there are some tricks to get inside their heads. “How to Find Out What Your Customers Want” gives an answer to the age-long business question. 5. Among all the diversity, Google Analytics is the only irreplaceable e-Commerce tool allowing to get know about your customers and their desires more. With the introduction of “Enhanced Ecommerce” feature, GA made the collection and analysis of customer behavioral data even more effective. “Google Analytics: Getting Started with Enhanced Ecommerce” contains every single bit of information you need to know about this novelty. 6. Loyal customers, still being customers, can become your biggest business partners. They are ready not just to spend more (and not once! ), but to recommend your brand to others. Get the most of your client base by making them even more profitable with “32 Tips for Maximizing Revenue from Your Existing Customers”. 7. Though the retention is crucial, customer acquisition is important too - after all, a part of them will become the loyal ones. So, on which clients to focus more? Should you acquire new leads and potential customers, or retain and nurture the already existing customer base? “Customer Acquisition vs Retention [Infographic]” will help to make up your mind and choose the right strategy. 8. Luckily, Instagram deals with the acquisition and retention equally good. This popular social network is a wonderful platform for product demonstration and getting customer feedback. But before becoming an effective marketing tool, your Instagram profile needs to get popular. So spend 10 minutes of your busy day and read “Instagram Exposed: Advanced Instagram Marketing Tactics to Get a Ton of Followers”. 9. With all the challenges merchants are fated to encounter, each of us craves for a word of inspiration, useful advice or just a motivational thought. “12 Inspiring Podcasts for Entrepreneurs” will not only encourage, but reveal to you the secrets of the most renowned people in the world of e-Commerce. 10. Finally, for a dessert we offer you to take a look on a fascinating interview with Andrew Bleakley - software developer, SEO optimizer and overall e-Commerce guru. Professional tips, valid facts, predictions for the future and personal details - all these in one of the most interesting e-Commerce interviews of March. The more you read - the more you learn, the more you learn - the more you can. Therefore, don’t forget to treat your brains with a daily dose of good writings on e-Commerce. And if you’re looking for a place with such a content, you’ve already found it! Cart2Cart Team hopes this digest of Top 10 e-Commerce Articles will become handy for each of our dear readers.